Let’s face it: there are some hilarious memes that only true gamers would understand. From respawn points to the toxic culture of multiplayer, the Call of Duty franchise has memes that have small kernels of truth. Activision would rehash the games like Transformers, but with a few modifications. Some weapons are just so OP that many players wonder how noobs even managed to possess them. Aiming for Prestige Rank these days requires so much XP that many players wait for the days when developers decide to host double XP weekends. There are many memes that call out these issues. The Call of Duty series has over twelve main titles in the franchise and has branched off into other mediums, including a comic book series. The franchise isn't going away anytime soon. It's latest game Call of Duty: WWII has earned over $500 million in sales on opening weekend alone, breaking its predecessor's record. The series is here to stay, and likewise related memes will continue to be made. With that said, here are the 18 Call of Duty Memes That Only True Fans Will Understand. A knife wound to the foot will end you quicker than an actual bullet on the head. Like most games, the series' game logic is pretty out of place. Headshots and bullet shots in the back will eventually get you killed regardless of your armor, but sometimes the old fashion way of killing with a knife is the most efficient way to make an easy kill. Players can sneak behind another player and wait for the open kill. Multiplayer players may recall the umpteenth time that their opponent snuck up behind them and knifed them in a “gun game” match. It’s become so notorious and well known that many people in the gaming community have a term for this-- knife-trolling. Although technically there is no official ban against knife-players, it's seen as a way to troll players out in the open. We've been through this and know what it feels like to get picked on out of the lot. There's nothing worse than getting picked on, not being quick enough to avoid a knife in the back, or receiving a couple bullets to the head. Multiplayer battles can get messy. In every team faction play, it sometimes feels like you're the one getting killed systematically-- especially when you see that your teammates are literally waltzing into the fields like Judy Garland from The Sound of Music. Newcomers to the game probably have felt like this, often getting picked out from the bunch. Then, there's that one camper who always has their favorite player to snipe and keep spotying them for experience points. When that happens, we always see the rest of our teammates as useless noobs, as they try to make up for one less soldier on their team. Call of Duty has a variety of military grade weapons and upgrades to go with each gun, so it’s not surprising that in multiplayer, players have multiple guns at their disposal. 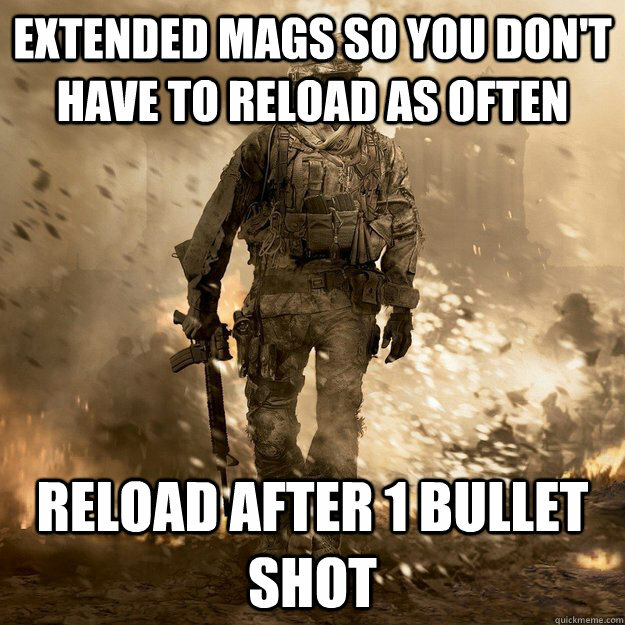 However, in reality, not even a military personnel would switch between four or five guns in an actual conflict, and they most certainly wouldn’t have the capacity to reload, which again is another fun tidbit of the series-- reloading after one bullet shot. The meme basically sums up how ridiculous a soldier would look if they carried all of their in-game weapons in real life. The amount of gear and different ammo, including a few scopes or red targets for your gun, would be impossible to carry into battle, let alone use. Not all guns are created equal. There's always those moments when players enter in hopes for a high caliber weapon, such as the Galil or another favorite gun, but instead receive incredibly terrible weapons. This meme sums up the other useless guns that we often get stuck with-- especially when the developers included it as a mystery box item. The assault rifle, Galil, has a 30-40 range and is stronger in close range combat. It has a low rebound rate, and depending on the player, it can prove to be a valuable asset. Equipped with a red dot and a suppressor, the Galil can take down opponents easily, with little recoil for each round. Veteran players with good control can whip up killstreaks quickly if opponents are grouped together. This is why it's understandable when a lot of players are frustrated about most of the other items being complete trash. They say we only live once-- but this doesn't take Call of Duty into account. The series itself is a video game, and thus no one ever actually dies. Obviously, the guns in the video game aren’t real and players can easily respawn and jump right back into the action. Unlike actual guerilla warfare, players can constantly come back to life, which this meme outlines. There are no stakes in video games, though many players take the game incredibly seriously and get butthurt when they die mid-match since it causes them their ranking. This might explain why the campaign mode does not have the same effect, since you could simply respawn again and again in the multiplayer mode. In real life, there are no respawns. There are two kinds of players: those who run and those who sit and camp for easy targets to kill. As with most FPS multiplayer games, Call of Duty follows the same suite where many inexperienced-- or even experienced-- players can be suddenly plucked off by a camper. Snipers can easily headshot players from incredibly far distances with little to no notice, which makes them so annoying. This meme pretty sums this up pretty well. When a player respawns, they transform into Liam Neeson 2.0s and begin hunting the camper down in retribution after that headshot. The image is from Taken, which has generated a number of memes on 4-Chan and Reddit. 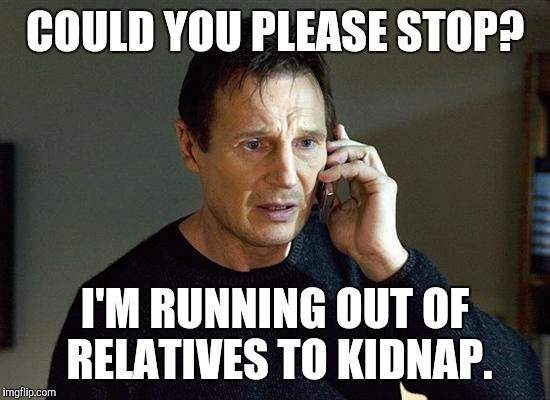 Ranging from Krillin to actual Taken films, the meme has become a part of pop culture, and no we won’t see the last of this Liam Neeson meme anytime soon. When you actually find a camper, you could either go full Liam Neeson on him-- or become Bruce from Finding Nemo. This meme captures what’s going on when a player finds a camper getting cozy in a hidden spot. The actual image is taken from the scene when Bruce the shark creeps up behind Dory and Marlin. Although Call of Duty and the Pixar film have no relation, the implications here are similar. Bruce surprises the two fishes from behind, just as a player who finds a camper would surprise the camper by taking them out from behind. However, don't expect the players to be as nice as Bruce... When a player discovers a camper who killed them, the player will get much joy from taking the camper out-- probably with a knife, which makes it all the more satisfying. The meme above focuses on a particular feature was extremely ridiculous. Activision has been consistenting churning out games with slight upgrades and glossed over storylines. So when it came to creating a new feature, they went diving underwater. The image is taken from Ghosts' press conference. Given that most of the games haven’t added anything groundbreaking, players and critics were skeptic-- similar to how they were when Activision announced the addition of a dog companion. Some fans compared it to the Super Mario 64 game that came out in 1996, mocking the new feature and arguing that there were other improvements that should have been done to the game instead. In the end, the underwater feature was not very exciting, though fans still bought the game. Back in the good ol' days there were only three killstreaks. Now, as they bring out new titles, there's always that one perfectionist who wants to claim seven kills for a helicopter feature or 25 kills to unlock a nuke WWII. Either it's because the player needs to complete their medals or they're simply fulfilling the quota for bragging rights. Killstreaks are one of the most unique features in the franchise. Once a player hits a set amount of kills, the player can send in outside weapons to take down enemy lines. The new 25 kill streak was implemented in WWII, which, if activated, would send a V2 Rocket, quickly ending the game. The seven killstreak became a meme in the gaming community, which focuses on players trying to get the highest amount of kills to activate these special weapons. In the past games, Activision promoted double XP for their newer series. Some fans have suggested that the developers should make Memorial Day a double XP day. Since the games have special promotions for holiday-related items, the developers might as well make the day of remembrance an opportunity for new promotions. It would make ranking up to Grand Prestige way easier than the daily grinding, and it wouldn't hurt to add more special days for extra perks. Just this past Thanksgiving, Express reported that Sledgehammer and Activision announced that WWII players will gain double XP to kick things off while apologizing for the recent launch failures. In addition, they've confirmed that they will release a new winter map called Winter Siege on December 8. Here's hoping for more event features. 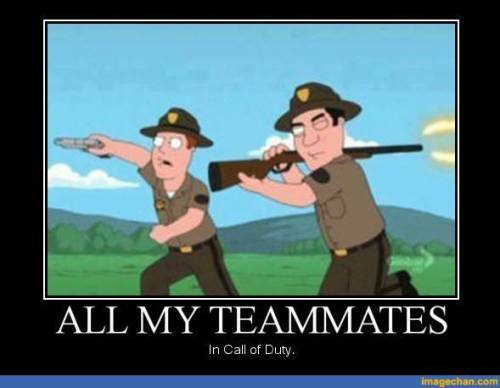 Players can relate to this the most when they’re playing multiplayer. The meme summarizes what it’s like to play 60+ hours in the game. Either the folks call the player a noob, if they're new, or a hacker, if the player has perfected every artillery and knife attack in the game-- that one player who has made it to Prestige or is on their way to that ranking. There is no middle ground, and there isn’t much room to acknowledge an actual pro during a heavy artillery fire. The meme sums up the the gaming culture in the multiplayer faction or in a wider scope of FPS. Not everyone is having a swell time, but we’re able to fork up the extra cash in exchange for a few more spins in the game series for a few new perks. However, there are few silver linings in the game if the players are local pals or teammates that share words of encouragement. When they announced that a dog was added into the mix, skeptics were unsure about how a dog would fit into the storyline. A few internet commenters shared this meme on Twitter of Doge carrying dog-sized tactic gear. The meme generated a few laughs. The meme was funny, but the comments made the it all the more hilarious and showed the absurdism in the new update. Riley, the German Shepherd turned out to be a valuable asset as a companion in the game. He’s able to dodge bullets and carry you while you’re with him on recon missions. This canine can also take out helicopter units at close range because... video game logic. Riley is basically Sam from Will Smith’s I Am Legend, but with a larger set of arsenals. What’s in the box? Pay 950 points and guess. Activision implemented the Mystery Box in Zombies as a unique feature. The box opens and there are several items to land on. If the player gets a teddy bear, then the box teleports to some place else. The meme addresses some of the weapons that you can get-- one being a tactical knife. The Ray gun is one of the best prizes you can obtain with 950 points, so it's no surprise that users would often go all out for a Ray gun. The Ray gun is a Wonder Weapon featured in Zombies and is perfect against a zombie hoard. It has an infinite range and a number of cool features that most standard weapons don't have. Buttering bread is typically an easy task. However, it isn't for a player who has raked up 60+ hours on Call of Duty. After so much time on the game, it's hard to image holding anything other than a tactical knife. If the player is an expert knife troller or someone who’s good with it, then they would have perfected the technique by generating perfect kills. This meme explains that it's hard to get out of the mentality of Call of Duty. While players may call out the games’ inaccuracies when it comes to physics of military weapons, knifing in the games is correct. Handling a real knife, however, does require such expertise-- especially since butter and tactical knifes are extremely different. Ramirez do something. We couldn’t forget the Ramirez jokes and how it quickly it became a popular meme among players. The origin of the meme came from Call of Duty Modern Warfare. In one of the single player campaigns, Private James Ramirez is ordered to do everything under Sergeant Foley. Foley gives over 50 orders to Ramirez, telling him to get out of the way for safety reasons but also offer assists. This caught on pretty soon in the 4-Chan community, where a huge number of related memes were created. There’s a full spreadsheet of these memes circulated around the net, as well as a video that repeats all of the lines used in the campaign. Users would often repeat these lines as inside jokes. Although this is an unspoken rule in most real time multiplayers like League of Legends, the same could be said in the Call of Duty franchise. No one dares to think about pausing in a multiplayer FPS game, especially if a player is playing with a team and their absence means that their team would have to carry them. Given that games’ multiplayer culture, it’s simply a no brainer. Similarly, one does not simply pause during multiplayer-- or for die-hard fans, one does not simply pause multiplayer until the player achieves Grandmaster Prestige. The "noob tube" meme surfaced to protest the M203 Grenade Launcher that was featured in Modern Warfare 2. The feature is an attachment to an assault rifle, and is an extremely powerful tool. The launcher was accessible in the game to noobs, hence the nicknamed "noob tube." Before the new balances, noobs could set off grenades early in the game and easily wipe out veteran players from a good distance. Because the weapon is broken, the weapon is frowned upon in the community. It takes away any validation of the game’s technical prowess. Veteran players' complaints went through and the company responded by making it more difficult to obtain the grenade early in the game. Later incarnations would offset the balance by increasing the price for it and preventing players from using it during the first 15 seconds of the games. The red stormtrooper is actually from an Adidas promotional event. He’s often seen outside the logo as a cool soldier who carries a boom box and wears a heavy gold chain. The Adidas stormtrooper is called HipHopTrooper and he posts a lot of images on Instagram. He became part of a meme generator that caught on with the rest of the meme community. The meme above explains it all. Whenever a Grandmaster Prestige waltzes in, the veteran player has bragging rights since they're obviously the best of the best. The creator of the meme referenced the rest of stormtroopers as a bunch of noobs. To achieve this rank, a player must go through hours of gameplay and achieve over a million XP to get to the level of the top players in the rank. Do you know of any other Call of Duty memes? Let us know in the comments!